Make this luscious Spiced Mexican Hot Chocolate with milk, chocolate and cinnamon. 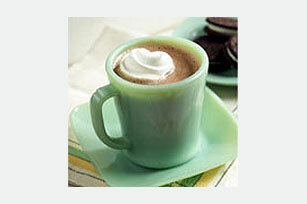 Dollop this Mexican hot chocolate with whipped topping and enjoy! Mix milk, chocolate and cinnamon in saucepan; cook on medium heat until chocolate is completely melted and mixture just comes to boil, stirring constantly. Pour evenly into 4 mugs or cups. Top each with 1 Tbsp. of the whipped topping. Serve each with 1 Chocolate-Dipped Cinnamon Stick (see Tip), if desired. Warm up with a cup of this Mexican-Spiced Hot Chocolate on occasion. Melt 2 pkg. (4 oz. each) BAKER'S Semi-Sweet Baking Chocolate, 1-1/2 pkg. (4 oz. each)BAKER'S Premium White Baking Chocolate (6 oz.) or 1-1/2 pkg. (4 oz. each) BAKER'S Bittersweet Baking Chocolate. Dip cinnamon sticks halfway into chocolate; let excess chocolate drip off. Let stand at room temperature or refrigerate on wax paper-lined baking sheet 30 min. or until chocolate is firm.